Fall of Icuras – With broken wings and a bright sun in the background we see the fall of Icuras. 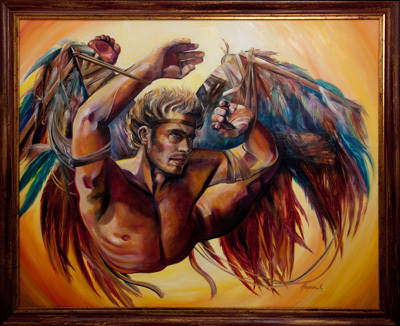 Icarus who from Greek mythology was the son of a master craftsman called Daedalus. This ancient story told us about Icarus attempt to escape Crete by using wings that his father made from feathers and wax. Ignoring his fathers instructions not to fly too close to the sun, Icarus flies towards the sun where upon the wax melts and Icarus falls into the sea below and sadly drowns.